October 19th, 2007: Rainy and warm, Water Temp 73* and clear. Picked clients up at their dock at 7 and went to look for fish. Dad said right off the bat " We just need for each of the kids to catch 1 fish, then the pressure will be off me". I knew that would not be a problem but I was concerned with the first front to produce rain in a month that was blowing in today. We looked for about 10 minutes for breaking fish that I saw yesterday but did not see any so I went to set up on a flat I ran yesterday. 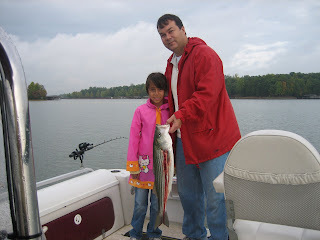 A few fish were working the area and Rebecca started the day off with catching the first Striper. Dad had a sigh of relief and we worked a little while longer and decided to catch more bait. 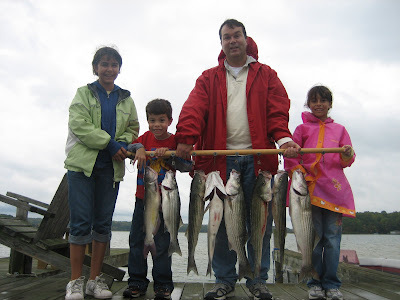 We caught bait with no problem and set up on another 22' flat where we saw numerous fish breaking but the Stripers were punks so we let the jump fisherman play with them and continued running the flat till Sara hooked into a nice Striper. Dad was feeling better now and we continued to fish. Jacob caught a Cat and lost a striper at the boat then we moved. 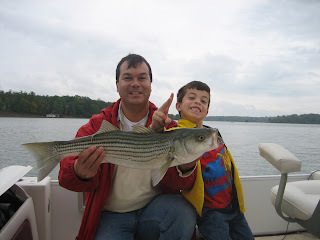 Found a school on another flat and Jacob made Dad proud by catching the largest fish of the day. We had 21 hits today, catching a few Cats and Stripers.